Because a certain Little Librarian is such a fan of The Hungry City Chronicles, I've had this series on my TR list for a while (ever since she read it). Then when it was announced a film adaptation of the same would be released in 2018 with Peter and Fran at the helm (!) I was done waiting. It reads very cinematically, for me, so I'm not surprised at all that adaptations are afoot. The initial world-build and premise is spectacular, and I look forward to seeing it interpreted. Unfortunately, I felt the initial impact of the concept wore old and lacked further depth as the story continued -- there was a lot more of the same -- leading me to wish it was a short story that left me breathless instead of a novel that waned. Yes, the nature of the cities changed (some), but not enough for me. The biggest disappointment was the dialogue. More and more I am realising that if a book has unoriginal or dull dialogue, I cannot bury myself in it. The exclamations and internal thoughts of the protagonist and comrade are a lot more simplistic and juvenile than I prefer; "That's not fair!" and "Are you coming?!" are included in the text. (To reiterate: Reeve being free and loose with the exclamations really didn't help, mentally deleting them appeased me somewhat.) The simplistic conversations made things easy to follow, but it created an awkward juxtaposition against the bleak backdrop and dark tone; instead of adding levity or beauty it was at odds. Am I reading a children's book? Because the characters I'm meant to get behind sound like little children. I was shocked when they were confirmed as teens, but then again relieved, since they were going through young adult stuff! I liked the evolution of language. The mondegreens of common idioms were believable and a very nice touch. 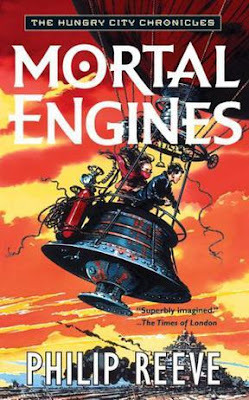 The new language associated with the mortal engines themselves took me longer to embrace -- as the vocabulary associated with them was stretched to encompass every aspect of their being in a way that felt like exactly that -- as stretch. I repeatedly reminded myself that vehicles now have already been subject to animalification (a V8 is aptly described as being "thirsty"), but it was harder for me to get completely on board with the analogy becoming so all-encompassing. Another strength is Reeve's quickly-rendered characters -- they come together vividly, fast. There's a fair amount of violence, but it's free from bad language and sensuality (alt world god names are used euphemistically). When pirates are introduced to the story it felt like an obvious bid to inject more adventure...but all I could think was how much I wish the entire story had been about pirates instead of these two kids...who for so much of the book are unkind and uninteresting. Back to the film on the horizon...another reason I'm excited about that prospect is that I think some of the things that were fairly clumsy in the book -- such as the exposition's introduction of character types, e.g. the aspiring orphan apprentice and the pretty girl, I hope will be more bearable on-screen. What it lacks in dialogue it makes up for in ambitious imagination...but it didn't continue to dazzle me. I'm basically saying that as was true with LOTR, I am hyper-confident I am going to love the movie/s more. it happens sometimes, and I'm pretty sure it's due to happen in October 2018 with Mortal Engines; this premise will become an epic adventure I can invest in Peter and Fran's hands, whereas now, it was lack lustre. Bring on the screen! P.S. Anna Fang = best.